"I knew that if I left Calvinism, we would lose everything. It was tough. There aren't any Orthodox Christians in our family. We had no place to live, we had no jobs, and the Calvinist church we had previously attended was not willing to help us with relocation. So we had nothing, except our peace of conscience. . . ."
In Piraí do Sul — a remote village not yet in contact with Orthodox Christianity — many residents live in poverty, struggling to survive. Steady work may pay only two or three hundred dollars a month, and the nearest Orthodox church is in the capital city of Curitiba, nearly three hours away. In a situation like this, what chance does a young person have to discover the Orthodox Faith? 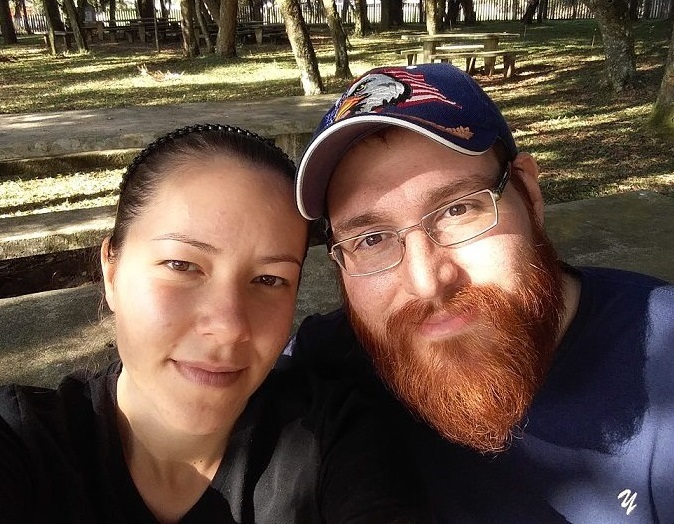 Geraldo & Karen are a young couple living in Piraí do Sul. They have dreams of living near an Orthodox church and becoming Orthodox Christians. They also hope to raise their children in a country where homeschooling is legal. To make their dreams come true, they are scrimping and saving, hoping to relocate to Russia. In this exclusive interview with Russian Faith, Geraldo tells his story, explaining how he and his wife came to live in Piraí do Sul, and why they left Calvinism behind, sacrificing almost everything they had, just to have the opportunity to become Orthodox Christians. Russian Faith: It's a pleasure to meet you, Geraldo! Please tell us a little about your background. Geraldo: I’m 25 years old now. I was born here in Brazil in 1993, in the city of Londrina. My Portuguese father was Roman Catholic, and my Italian mother was an evangelical Protestant. Sadly, when I was four years old, my parents split up. My mother and I moved to my grandparents' house and lived with them for the remainder of my childhood. When I was 11, we all moved to Curitiba, the capital city of our state. As I got older, I gradually got more interested in religion, and I was baptized at the age of 17, in a charismatic church. RF: After finishing high school, did you go to college, or did you immediately join the workforce? Geraldo: My family encouraged me to go to college and get a degree. I went to the university and got a four-year degree in International Relations. RF: How did you meet your wife? Geraldo: During my senior year in college, there was a get-together at my church, and I met Karen there. She was also going to college, and we ended up attending the same church. We were both interested in theology, and our religious beliefs were very similar (we both became Calvinists). I proposed to her in 2015, even though I was not yet ready to support a family financially. We knew it would be difficult, but we also knew that we wanted to spend the rest of our lives together. RF: Throughout her childhood, did Karen have religious background similar to yours? Geraldo: She was actually raised Roman Catholic, but at the age of 16 she was exposed to very different influences. She joined a Protestant congregation at the age of 17, and later ended up at the same church I was attending. RF: When you got married, is that when you started living in the village of Piraí do Sul? Geraldo: Not yet. We started our lives together in the city of Londrina. We weren't wealthy, but we had everything we needed—a good apartment, furniture, appliances—all the basics. Geraldo: Well, initially we left Londrina so I could attend seminary. My love for Christ had grown to the point that I wanted to study theology and dedicate the rest of my life to Christian ministry. At the time, we were attending Igreja Reformada de Londrina, which was the only Reformed (Calvinist) church in town. I had been studying Reformed theology and biblical languages, and the leaders of that church encouraged me to attend seminary. They agreed to cover all the costs of our travel and living expenses, if we would be willing to leave everything behind and start a new chapter in our lives. So we gave up our apartment, appliances, furniture, and my teaching job, and we moved across the country. I started attending the John Calvin Institute, a Reformed seminary in northwestern Brazil. RF: Were you able to complete your studies at the Calvinist seminary? Geraldo: The academics were ok, and I had no problem with the classes. But before I had completed the full course of studies, I started having serious reservations. I became aware of so many internal contradictions in Calvinist theology, and I realized there are major problems with its ecclesiology. Karen and I wanted to follow Christ, and we became convinced that Calvinism is not a viable way to do it. RF: Is this the point where you discovered the Orthodox Church? Geraldo: Well, Brazil is mostly Roman Catholic. There are very few Orthodox churches anywhere in the country. If it hadn't been for the internet, I might not have realized that Orthodox Christianity was a viable option. RF: So you encountered the Orthodox faith online? Geraldo: Yes. In fact, I was profoundly impacted by the Russian Faith website. I read about how Orthodox Christianity has positively transformed so many of the dynamics in Russian society. That helped me see that the Orthodox Church is a living spiritual body, and not a dead church, as Protestants and Roman Catholics had both suggested. As I studied more and more about the Christian faith, I felt more attracted to Orthodoxy, and still now I'm trying to learn as much as I can. I managed to learn much from the Russian Faith website, so much that I felt indebted to it. That's why I eventually volunteered to translate a lot of articles into Brazilian Portuguese, so that a Brazilian version of the website could be created. I wanted to help in any way I could, to assist with this initiative. RF: So you left the seminary early? Geraldo: It was a very difficult decision. Karen and I had already given up our apartment and nearly all our belongings, and now a Calvinist congregation was providing our living expenses. As long as I continued attending the seminary, we would continue receiving support. But I knew that if I left Calvinism and became an Orthodox Christian, we would lose everything. It was tough. There aren't any Orthodox Christians in our family. We had no place to live, we had no jobs, and the Calvinist church we had previously attended was not willing to help us with relocation. So we had nothing, except our peace of conscience. RF: Is this the point where you moved to the village of Piraí do Sul? Geraldo: Initially we tried moving back to where we had lived before, but we were not able to afford the cost of living in a big city. So we had to move to a small town in a rural area. My wife's mother lives here in Piraí do Sul, and she is letting us stay with her until we can get back on our feet. It has been a year now since we came to this village. This country is in the midst of an economic crisis, and there are not many job opportunities here. So we have managed to do a bit of everything, finding whatever odd jobs are available to help make ends meet. Each month I am able to earn about one thousand Brazilian reais. In American terms, that only amounts to about $250 per month, so it is difficult to save much. RF: Have you been able to find many Orthodox books, which have already been translated into Portuguese? Geraldo: Unfortunately not. As far as Orthodox literature is concerned—in the Portuguese language—there is a real void. In Portuguese, all we have from the Early Church Fathers is translated poorly, almost always biased in favor of Roman Catholicism. And even these sorts of books are very costly, making them only accessible to Catholic clergy. In Brazil, Catholic laymen generally don't read the Fathers, so there is very little market for these sorts of books. I recently discussed this with Bishop Damasceno, an Orthodox bishop in Portugal. He told me that he has to do much of his reading in English. Unfortunately, good Portuguese-language Orthodox resources are just rarely available. Someday, I pray that the Lord will provide an opportunity for me to help fill this void. I would gladly work on a project, translating Orthodox books and literature into Portuguese. If the 200 million people in Brazil are ever going to hear about the Orthodox Christian faith, these sorts of translations are going to be absolutely necessary. RF: Are you and Karen attending an Orthodox church now? Geraldo: We really want to. A few big cities in Brazil have some beautiful Orthodox churches. But if you don't live near a big city, they are very hard to find. The nearest one is located in the city of Curitiba. I have attended a few divine liturgies at the Church of St. George, which is an Antiochian Orthodox parish there. Unfortunately, the church is about 200 kilometers from the village where we live, and we don't have a car, so it is quite far. Thankfully, an Orthodox priest has taken us under his wing, and he is helping us in our current situation. He is providing catechism for us remotely, providing reading materials, discussing theological topics, and answering various questions that come up. We are doing everything we can to prepare ourselves, so that when we can move close to an Orthodox parish, we will be ready to enter the Church. RF: To attend an Orthodox church, are you planning to move back to the city? Geraldo: If I was single, that's probably what I would try to do. But Karen and I really want to have children, and Brazil is a scary place to raise a family. The government schools have embraced a monstrous homosexual agenda, and it is mandatory for children to attend public school, beginning at the age of four. Just this year, the Supreme Court of Brazil denied a congressman's attempt to legalize homeschooling. It was really depressing. RF: So what are your plans now? Geraldo: My wife and I are seeking for a better place to raise our family. We plan to work, save, and use any resources we have to pave our way to Russia. Homeschooling is legal there, and there are many Orthodox Christians. If we can move to Russia, we should be able to safely raise our children there. Initially, I will need to study the Russian language. Then I hope to attend a Russian university. I also pray that God will provide a good job, so that I can work to support my family. RF: I have heard there are similarities between Russian and Portuguese. Is it true? Geraldo: There are some superficial similarities between the two languages. There is even a video out there, pointing out reasons why Russian and Portuguese often sound similar. But the fact is, they are very different languages. A Portuguese speaker and a Russian speaker would not be able to understand each other. RF: So you are probably studying Russian at this point? Geraldo: I am trying to. There aren't any Russian teachers here in the village where I live. But I am able to study resources that I find online. RF: Do you and Karen have any immediate needs? Geraldo: In preparation for entering a university, I am trying to save money for a laptop computer. Because of the high shipping costs, high taxes, and high import duties on foreign electronics coming into Brazil, a new laptop here costs around $1200 USD. Karen and I also need to relocate to Russia, and find some way to cover basic living expenses when we first arrive in Russia. We will also need Russian language lessons. I am working hard, and I have been saving for months. It is just taking a long time to save enough to cover everything. But we are doing our best. RF: Is Karen onboard with the idea of moving to Russia? Geraldo: Yes, she is truly committed to the idea. She has read a lot about Russia, and she is in full agreement that this is the right move for us. We really want to become Orthodox Christians, and we want to raise our children in a place where homeschooling is allowed, and where the government is not being controlled by the homosexual agenda. Please keep us in your prayers, and ask God to help us. RF: We pray that God will help you. And we are setting up a fundraiser to help you and Karen. For everyone who reads your story, we are asking them to make a donation now, and also to share your story with others.